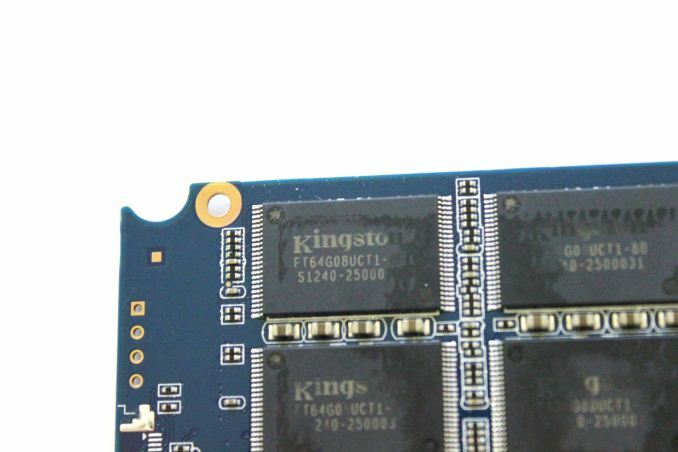 If you are a forum active or a recent buyer of Kingston SSDNow V300 SSD, there is a chance that you're aware of its performance issues. In short, users have been reporting lower performance (up to 300MB/s difference in AS-SSD sequential read speed) of drives with 506 firmware pre-installed, which is the version retailers currently sell. I've received numerous emails regarding this issue from readers looking for answers, and now I finally have them. Like many SSD OEMs, Kingston buys its NAND in wafers and does its own validation and packaging. As a result figuring out the original manufacturer is not possible without the help of Kingston because there are no public data sheets or part number decoders to be found. I've never been a big fan of OEM-packaged NAND because OEMs tend to be more tight-lipped about the specifics of the NAND and it's easier to silently switch suppliers, although I do see the economical reasons (NAND is cheaper to buy in wafers). So far there's not been much harm from this but I've been fairly certain that someone would sooner or later play dirty and use NAND packaging as a way to mask inferior NAND. Unfortunately that day has come, and as you can guess the OEM in question is Kingston and the product is their mainstream V300 SSD. The first generation V300 (which was sampled to media) used Toshiba's 19nm Toggle-Mode 2.0 NAND but some time ago Kingston silently switched to Micron's 20nm asynchronous NAND. The difference between the two is that the Toggle-Mode 2.0 interface in the Toshiba NAND is good for up to 200MB/s, whereas the asynchronous interface is usually good for only ~50MB/s. The reason I say usually is that Kingston wasn't willing to go into details about the speed of the asynchronous NAND they use and the ONFI spec doesn't list maximum bandwidth for the single data rate (i.e. asynchronous) NAND. However, even though we lack the specifics of the asynchronous NAND, it's certain that we are dealing with slower NAND here and Kingston admitted that the Micron NAND isn't capable of the same performance as the older Toshiba NAND. Update: Apparently there is also a newer revision with 521A firmware floating around that utilizes the slower asynchronous NAND. Update 2: NordicHardware has tested both the 505A and 521A versions and their testing confirms the decrease in performance. What is even more alarming is that based on their tests, the performance decrease is not limited to just incompressible performance but there is a noticeable difference in real world trace-based tests as well. The article itself is in Swedish but the graphs should be easy to understand and you can always use Google Translate. I have to say I'm disappointed. I thought the industry had already learned from its mistakes and that a switch in NAND supplier shouldn't be done silently (remember the hullabaloo OCZ caused when they silently switched from 34nm to 25nm NAND in Vertex 2?). Kingston assured me that this wasn't an intentional attempt to screw customers but a strategy decision made in order to stay within the bill of materials. Kingston was aware that they would have to switch suppliers at some point and in fact they are now looking for yet another supplier (likely Toshiba again). Frankly, I don't see the supplier change as an issue; the problem is that it was done without any notice and there's no public indication of what sort of NAND you'll get. Kingston did say that they considered updating the name to V305 or similar to distinguish the two but in the end decided against that. In our talks we agreed that it wasn't a very good decision. It's not fair to sample media with one thing and then later start selling something else. Not everyone reads reviews but the buyers who do expect a certain level of performance and it's obvious that they will feel cheated if their unit performs significantly worse. I hope this is just a one-time occasion because that's perhaps excusable, but if this becomes a habit things will start to be fishy. Ultimately, the V300 wasn't a particularly fast SF-2281 SSD when it launched, but with the NAND update it's become quite a bit slower than other alternatives. Surprised it took this long for AT to do a piece on this. I've been steering people away from the Kingstons for awhile unless they're on a serious fire sale. Excepting DDR memory, do not purchase Kingston brand's any other else what. that, I figured it sensible to do a quck test just ran AS-SSD on my ancient 3.5"
read and 77MB/sec 4K write, so I was right, better than the newer V300). SATA2 models from several years ago (do people actually buy the SanDisk Pulse? of a decent 240GB/256GB has only now matched the low they reached in Jan/13).